Fantastic 3 bedroom, 2 bathroom East Vancouver townhouse for sale in the popular ‘Works’ complex. This spacious 1260 sqft home has numerous upgrades like reclaimed wide-plank fir floors throughout, built-in closets, roller blinds, brick feature wall on the main floor and wood accent feature wall on the master level. The main has the kitchen granite counters, pantry, KitchenAid stainless appliances, gas range and direct access to a balcony with gas hookup for your summer bbq’s. The open plan dining and living area is highlighted by a gas fireplace with custom wood mantle. The middle floor has 2 big bedrooms, a full bath and newer laundry. The top floor is a true master suite with room for a king bed, ample closet space, full ensuite bath and a big, private, south facing sun deck. Two side by side parking stalls and a storage locker come with the purchase of this stylish and functional home. This well run strata allows pets and rentals with restrictions. 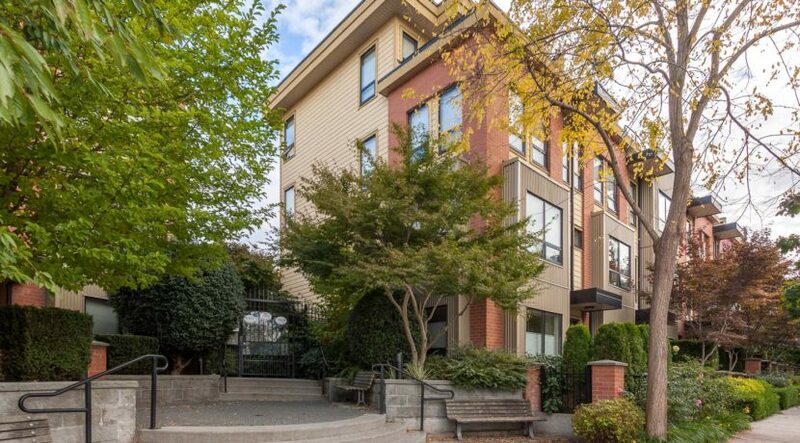 Steps from transit, Trout Lake, Commercial Drive, shops and schools.